Chocolate sponge cake with white chocolate cigarellos curls round the sides. 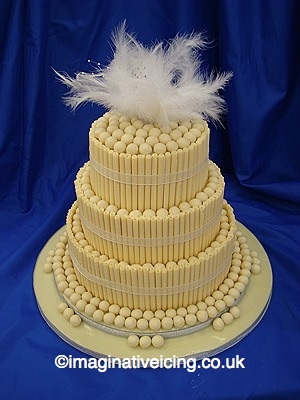 White chocolate maltesers arranged on the tops of each tier. The top decoration of white feathers and diamante beads is optional. this design is also available in, Milk and Dark Chocolate or in all three contrasting chocolates.